From the proselytizing lantern slides of early Christian missionaries to contemporary films that look at Africa through an African lens, N. Frank Ukadike explores the development of black African cinema. He examines the impact of culture and history, and of technology and co-production, on filmmaking throughout Africa. Every aspect of African contact with and contribution to cinematic practices receives attention: British colonial cinema; the thematic and stylistic diversity of the pioneering "francophone" films; the effects of television on the motion picture industry; and patterns of television documentary filmmaking in "anglophone" regions. Ukadike gives special attention to the growth of independent production in Ghana and Nigeria, the unique Yoruba theater-film tradition, and the militant liberationist tendencies of "lusophone" filmmakers. He offers a lucid discussion of oral tradition as a creative matrix and the relationship between cinema and other forms of popular culture. And, by contrasting "new" African films with those based on the traditional paradigm, he explores the trends emerging from the eighties and nineties. Clearly written and accessible to specialist and general reader alike, Black African Cinema's analysis of key films and issues—the most comprehensive in English—is unique. 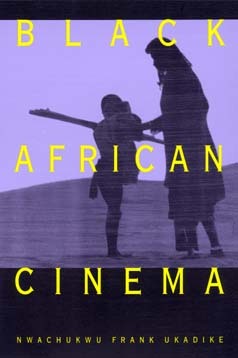 The book's pan-Africanist vision heralds important new strategies for appraising a cinema that increasingly attracts the attention of film students and Africanists. N. Frank Ukadike teaches in the Department of Communication and in the Center for Afro-American and African Studies at the University of Michigan, Ann Arbor.